Fresh parking lot striping serves multiple benefits for business owners. Not only does it provide a safe and organized driving area for customers, it also make a public statement. New line striping tells the public that business owners care about their appearance and customer safety. There is just something about a professionally striped parking lot that is welcoming to visitors. Without a doubt, fresh line striping provides a great impressions on the visitors. Berkeley Services is all about providing superior parking lot striping for Katy, Texas. We understand the importance of a beautifully and uniform striped parking lot. We operate 24 hours a day to make sure we accommodate our customers schedules when the least amount of traffic is visible. 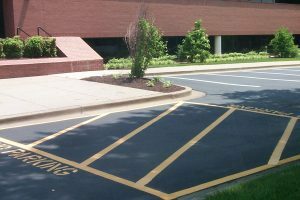 Along with excellent parking spot striping, we provide fire lane striping and emergency signs. The city of Katy requires all public parking lots to provide fire lane parking for emergency vehicles. This information can be found on Katy, TX Code and Ordinance page. The proper fire lane striping is vital for the safety of the public and the building itself. It provides a safe, no parking area, for emergency vehicles. Parking lots located within Katy, without the proper fire lane striping, could be facing a hefty fine. Berkeley Services ensures that our emergency striping is in accordance with all codes. 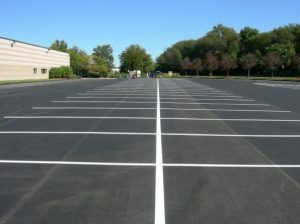 The pricing of parking lot striping can be broken down into a few areas. 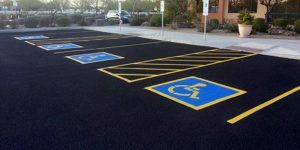 The areas consist of: The Size of the parking lot, The number of parking spaces, the number of ADA (handicap) stenciling, the number of cross walks, new or replacement striping, and the linear foot of curb to stripe for fire lane. These variable are easy for us to calculate. We can even help you determine the max capacity of your parking lot. As a Houston Line Striping Company, We are devoted to providing excellent services and quality parking lot striping for our local community.